Here is another of The Wowdies cards from the 1980-81 sets. 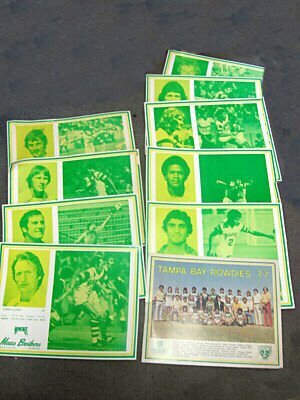 A collection of Maas Brothers Promo Cards, the cards are of Derek Smethurst, Joey Fink, Paul Hammond, Lenny Glover, Stewart Jump, Adrian Alston, Rodney Marsh, Arsene Auguste, Farrukh Quraishi and a 1977 Rowdies team group. 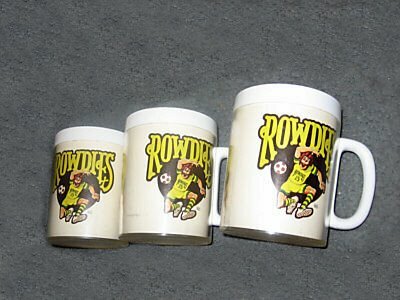 Three different size plastic Rowdies mugs. 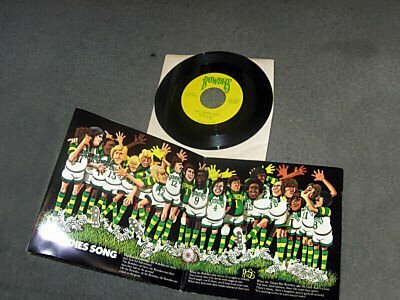 The Rowdies 7" record, "A Kick In The Grass...", with gatefold sleeve cartoon drawing of the 1975 Rowdies players. Joey Fink celebrates scoring a goal during an indoor game. 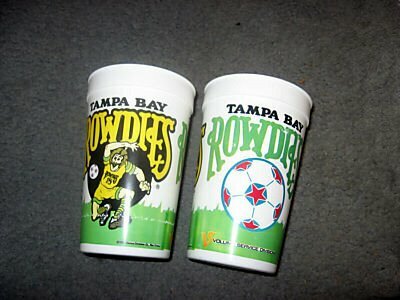 Front and back views of Rowdies plastic cups. 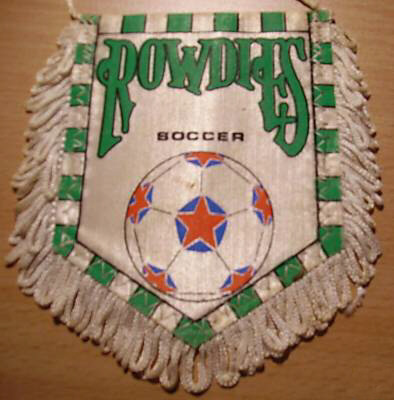 A Rowdies pennant produced in France. 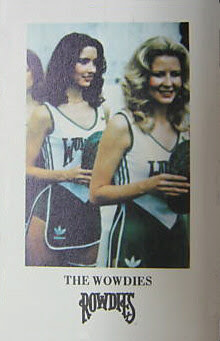 The Rowdies at the Edmonton Drillers, with Oscar Fabbiani, Wes McLeod and Dave Taber (11). 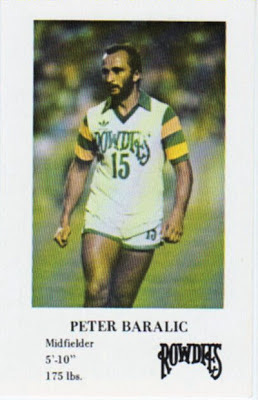 Steve Savage's signed Rowdies card. 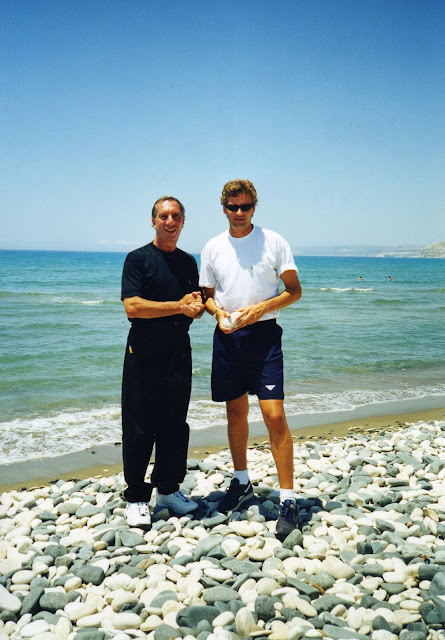 Here is a recent photo of Karim Murabet (AISA 1986-87) on the right, with Carlos Bilardo. 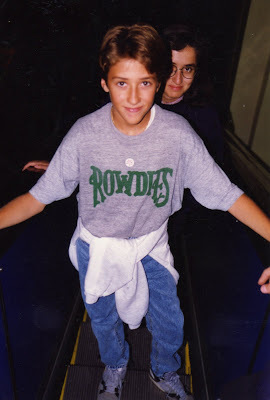 Karim's nephew Jehad Muntasser, seen here wearing a Rowdies Tee Shirt during the 1986-87 season. Jehad followed his uncle Karim into soccer. Jehad started his career at Italian side Pro Sesto, before being signed by English Premier League side Arsenal in 1997. He made one brief appearance for Arsenal's first team, coming on as an extra time substitute in the 119th minute of a League Cup match against Birmingham City on October 14th, 1997. He was sold to Bristol City in January 1998 but was released by them on a free transfer in the summer of 1999 without playing a first-team game. After his release Jehad returned to Italy and has since played for a string of Serie C and Serie B clubs - Viterbese (1999-2000), Catania (2000-01), L'Aquila (2001-02), Triestina (2002-04), Perugia (2004-05) - before joining newly-promoted Serie A side Treviso in 2005. Treviso however were relegated on their first season back at the top, and started the 2006-07 season back in Serie B. He was released on free transfer by his club on January 2007, and later signed for a Qatar club, Al-Wakra Sports Club, in January 2008 Jehad Signed for Al Ittihad of Libya, Where he currently plays. Many thanks to Karim Murabet for these photos. 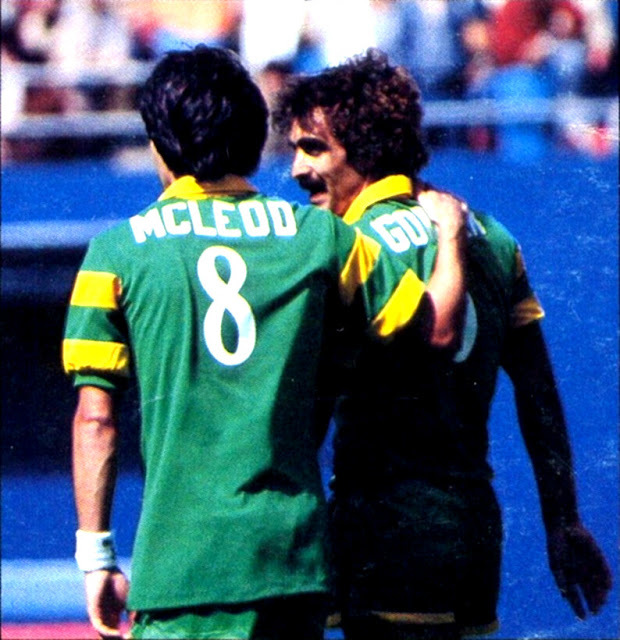 Wes McLeod and John Gorman. 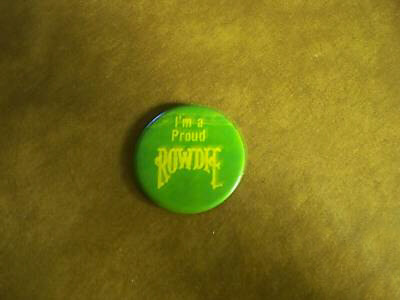 A lapel pin with the wording "I'm A Proud Rowdie". 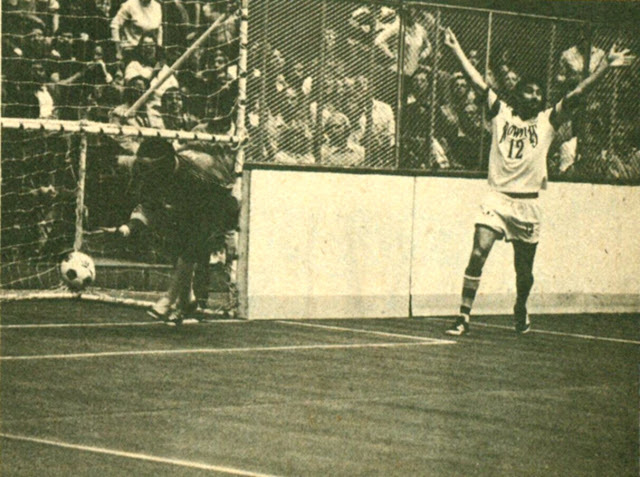 San Diego Sockers' Kaz Deyna turns after scoring against Jurgen Stars and Mike Connell, during an indoor game. Jurgen Stars and Refik Kozic defend against the Montreal Manic. 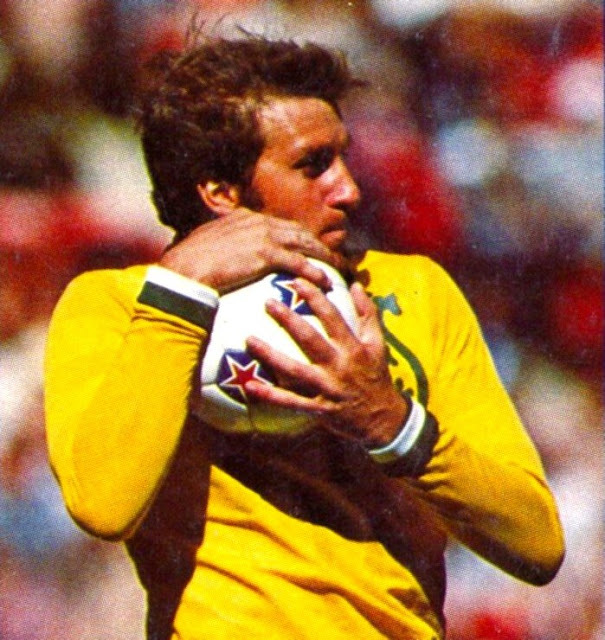 Jurgen Stars thwarts Strikers' Cubillas, with Glenn Myernick. Jurgen Stars and Wes McLeod during an indoor game, against the Toronto Blizzard. 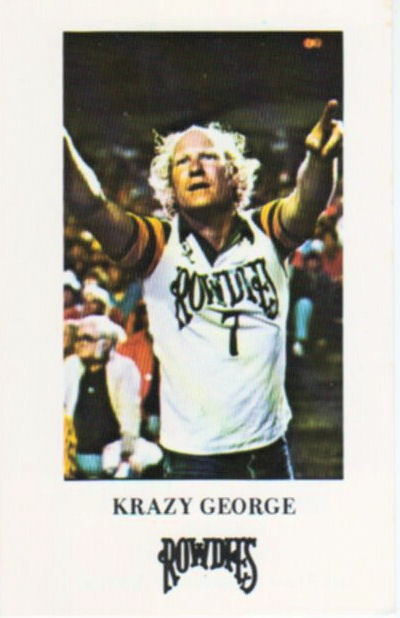 This is from the 1980-81 sets. 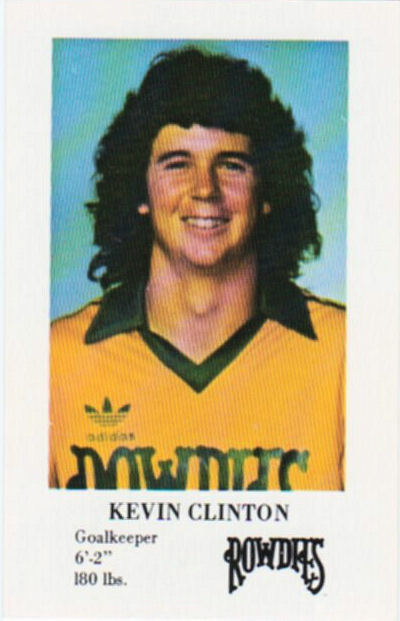 Assistant Coach Keith Peacock card. 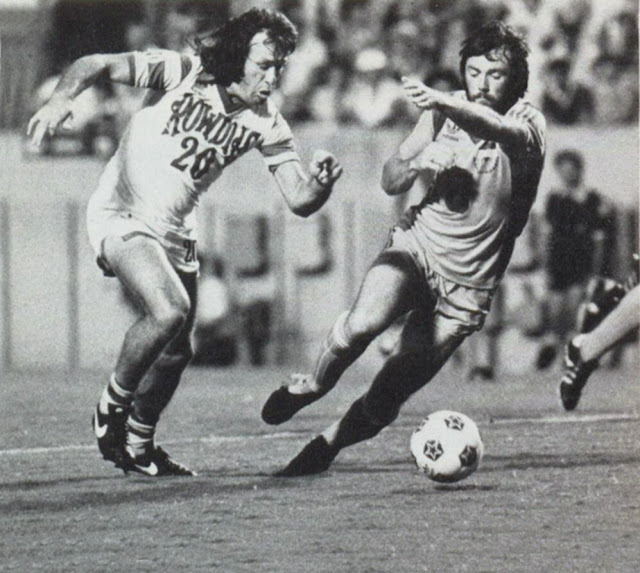 Oscar Fabbiani takes on LA Aztecs' John McGrane. 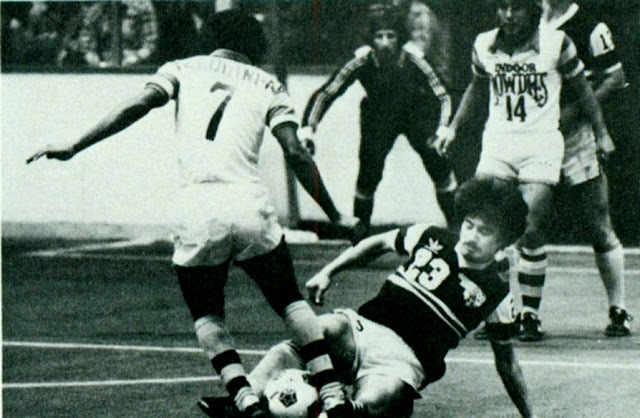 Zequinha and Tatu against the Chicago Sting during a 1981-82 indoor game. 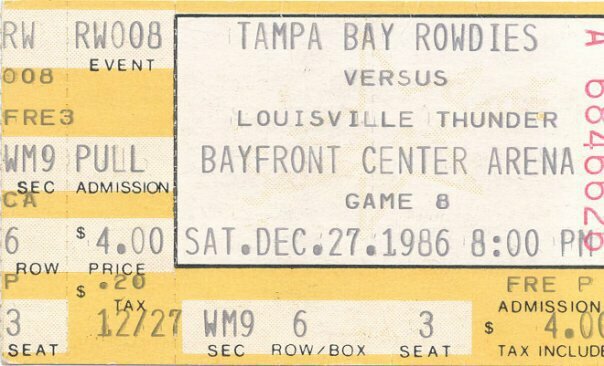 This ticket stub is from the AISA game against the Louisville Thunder on December 27th, 1986. 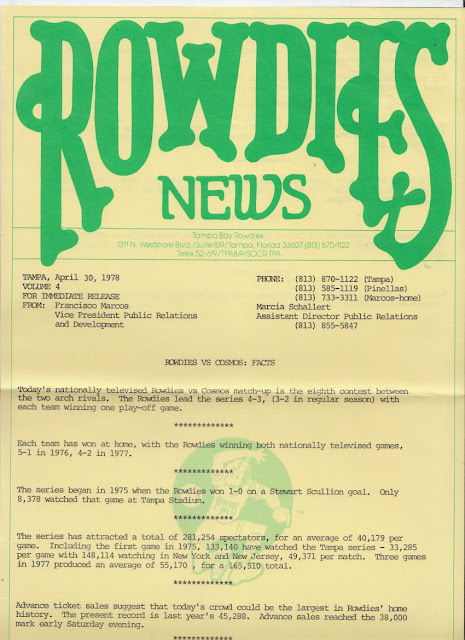 A Rowdies Press release for the April 30th, 1978 game against the Cosmos. April 30th, the New York Cosmos were today's opponents. 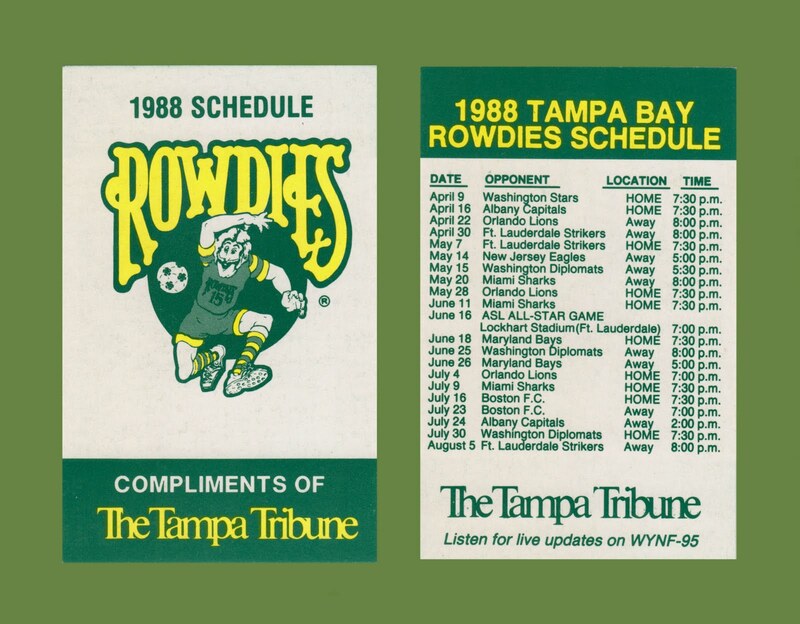 With an attendance of 41,888 watching the Rowdies lose 2-5 with goals from Wes McLeod and Rodney Marsh. 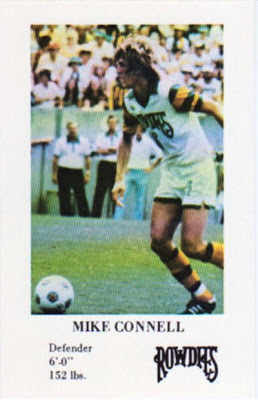 The team this day: Hammond, Auguste, Eagan, Papandrea, Connell, Paddon, McLeod, McGuire, Robb, Marsh, Wegerle. 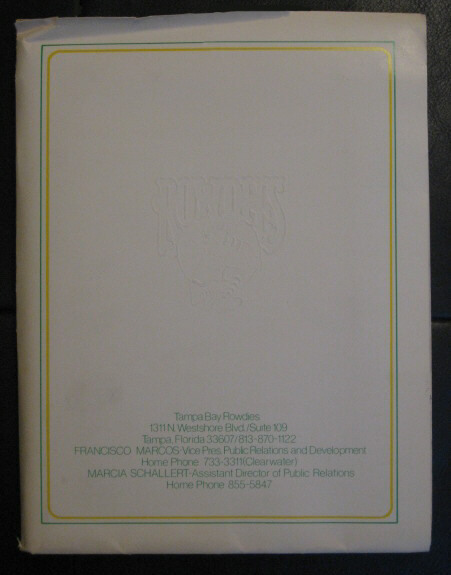 A Rowdies folder given out to the media in 1978. Peter Nogly and Refik Kozic during an ad campaign. Jurgen Stars during an indoor game. This is part of my Rowdies pocket schedules collection, pictured is the front and back of the 1988 ASL schedule. Mike Connell promoting Tampa Bay Soccer. Mike Connell keeps possession against Strikers' David Irving. 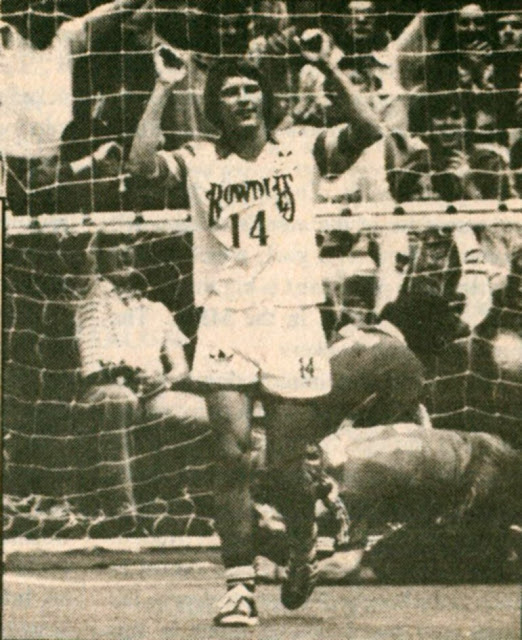 Derek Smethurst celebrates scoring a goal during a 1977 indoor game. 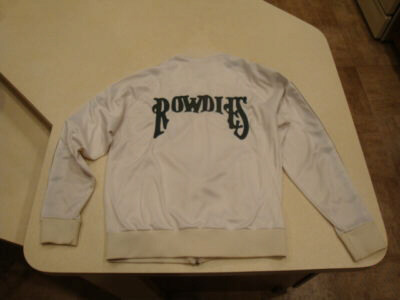 Soccer Bowl '79, Rowdies vs Whitecaps, with Mike Connell being watched by Ivan Grnja. Stewart Jump watches Pele do his bicycle kick during a 1977 game. Frantz St. Lot and Mike Connell. Manny Andruszewski and Winston DuBose against the California Surf. 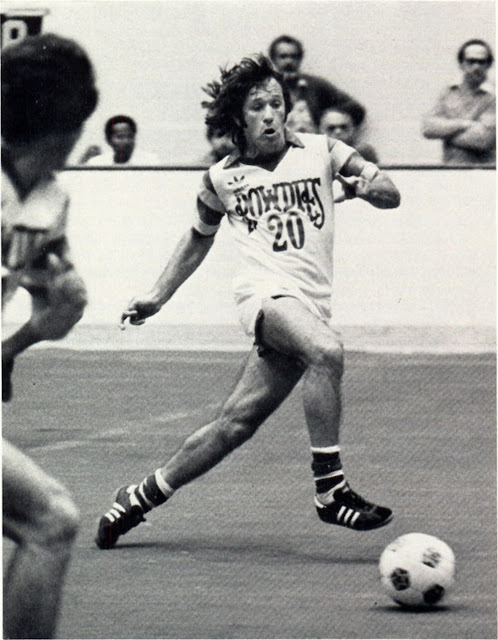 Oscar Fabbiani in action during a 1980-81 indoor game. 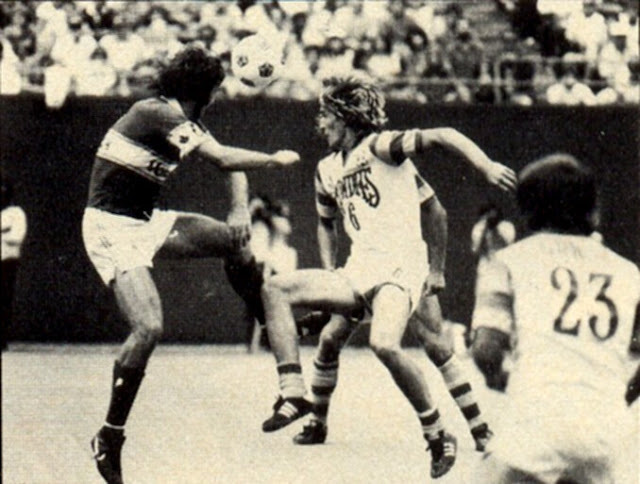 Steve Wegerle in action against the New York Cosmos during Soccer Bowl '78. 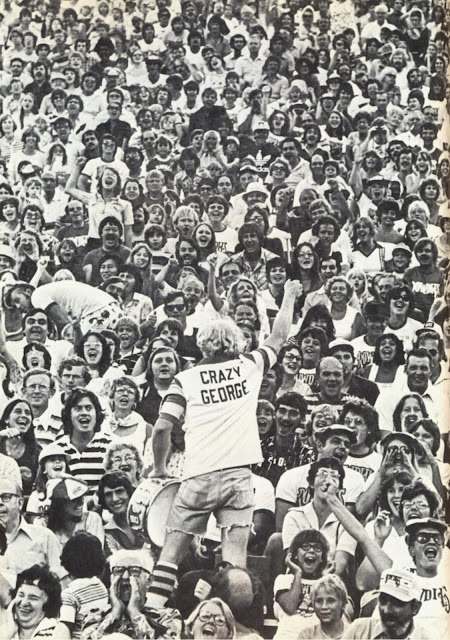 Crazy George tries to get the crowd singing. 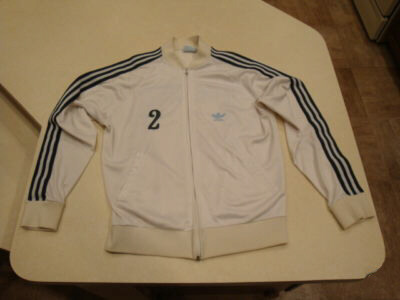 This is from the 1982 set. Jurgen Stars in action during an indoor game.